The puppy featured herein is now eleven months old and weighs 90 lbs. So my wife and I picked up our new puppy yesterday. His name is Gus. He is a Yellow Labrador Retriever. He joins Sadie, who is almost 14 years old, and Beau, who is 6 years old. They were not too enthused about the idea of bringing in an 8 week old baby to change their lives. Three is a crowd perhaps. We spent the day as an orientation period. Gus seems smart and curious. He is pretty brave. He likes following the older dogs. He wants to make friends. They are usually tolerant, but Beau snapped at Gus when he got too close to his personal bone. Sadie left the living room at bedtime and, instead of sleeping there as usual, showed up in our bedroom. Turns out that was a smart idea. 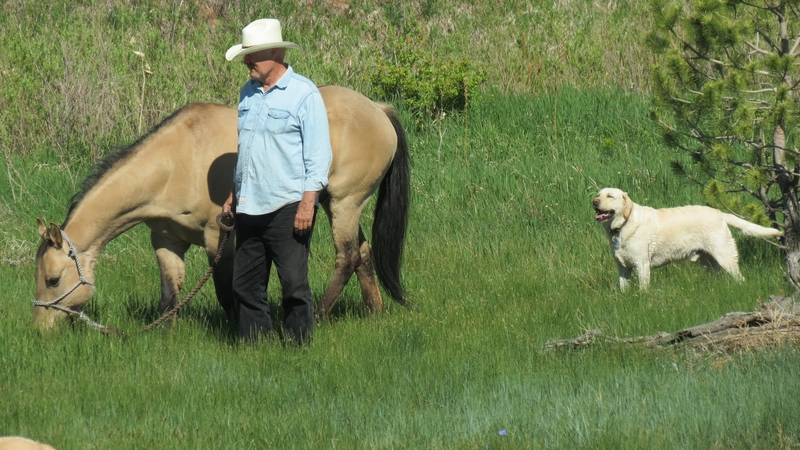 An old cowboy was riding his trusty horse followed by his faithful dog along an unfamiliar road. The cowboy was enjoying the new scenery, when he suddenly remembered dying, and realized the dog beside him had been dead for years, as had his horse. Confused, he wondered what was happening, and where the trail was leading them. After a while, they came to a high, white stone wall that looked like fine marble. At the top of a long hill, it was broken by a tall arch topped by a golden letter “H” that glowed in the sunlight. Standing before it, he saw a magnificent gate in the arch that looked like mother-of-pearl, and the street that led to the gate looked like gold. “Wow! Would you happen to have some water?” the man asked. “How about my friends here?” the traveler gestured to the dog and his horse. “Of course! They look thirsty, too,” said the man. The trio went through the gate, and sure enough, there was an old-fashioned hand pump with buckets beside it. The traveler filled a cup and the buckets with wonderfully cool water and took a long drink, as did his horse and dog. When they were full, he walked back to the man who was still standing by the tree. “What do you call this place?” the traveler asked. “This is Heaven,” he answered. I did not write this, but I like it and wanted to pass it on. I do take credit for the authentic illustrations.